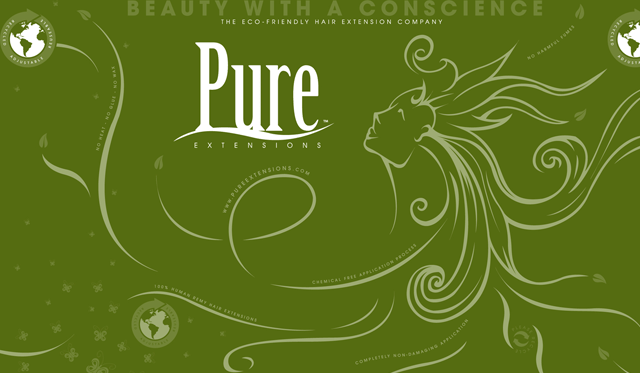 As the first ever hair extension company to be founded on the notion of conservation, PURE Extensions recognizes its role as an eco-conscious producer and its ability to effect a positive change. PURE believes that style and beauty can coexist with eco-consciousness. From the hair and application process, to the packaging and production, no waste is tolerated. Our hair is the finest quality 100% human Remy hair and completely synthetic free. The application process does not use heat, glues or waxes so there are no harmful fumes emitted, or chemicals used that can be damaging to the stylist, client or environment. Our damage-free application process allows for a much longer extensions lifespan. When properly maintained, the wearer can keep the extensions in their hair three to four times longer than traditional extensions. Once the extensions are permanently removed we ask our stylists to return the used hair to us so that we can deliver it to our partner Matter of Trust, who takes our recycled hair and uses it to soak up oil spills. Last year over 2,600 oil spills occurred in the world. They weren't all high profile, but most had an impact on the environment. PURE strives to limit the amount of packaging used and makes the necessary packaging out of recycled materials or is recyclable itself. To package the hair, PURE uses biodegradable bags that break down completely when in contact with other decomposing materials, whether in compost bins, landfills, or just buried in the ground. Also, these bags can be recycled along with regular plastic bags. For the printing we use vegetable-based inks which help us reduce harmful carbon emissions. The world is changing and we believe with alternative energy sources, reusable materials, organic products and more, we can bring eco-consciousness to the beauty industry and bring about a positive change.